Summary: Before you can even say “when,” the Asus Eee Pad Slider is already in-stock at Amazon, B&H and Newegg. Earlier this week, I mentioned the Asus Eee Pad Slider will be coming to America later this month, but it turns out the end of September is now because the Taiwanese company has just announced the laptop-like-tablet is already in stores as I write. Both the 16 GB and 32 GB models in “Mocha” (as above) are in-stock stateside, with the 16 GB retailing for $475 and the 32 GB for $580 — just a touch cheaper than iPad 2s. Unlike its better known cousin the Transformer, the Slider has a built-in QWERTY keyboard, runs Android 3.2 (Honeycomb) out-of-box, and offers a multi-touch 10.1-inch 1280 X 800 screen with a 178-degree viewing angle. In addition to the on-board storage, each slate also includes a year’s worth of unlimited cloud storage with ASUS WebStorage, for all your media consumption and backup needs. Or, you could expand its capacity and move photos via the built-in microSD slot, plug in USB 2.0 devices, or even hook the tablet up to your HDTV using the micro-HDMI port. The Slider also comes preloaded with Polaris Office 3.0 so you can make use of that QWERTY keyboard right away. Amazon: Only one, third-party company, the Taiwan-based Rinato, is offering the 16 GB Slider but is charging a ridiculous $699.99 for a product that should retail for $475 in America. Newegg: Currently, Newegg only has the 16 GB in-stock but you could sign up to receive updates on the 32 GB. Either the company carried very few 32 GBs or some very determined enthusiasts snapped them all up already because the site seems to suggest it has already moved some units. B&H: This is the only website that has both the 16 GB and 32 GB in-stock at the same time and at the suggested retail prices. If you do plan on ordering a Slider from one of these sites, I’d suggest double-checking its return policy before handing over your money. Newegg, for example, will only replace defective devices but not offer any refunds. I hope the Slider will be as yummy as its color, “Mocha,” but will reserve judgment until I can get some hands-on time with this slate. I’m especially curious whether the keyboard is comfortable to type on. How about you? 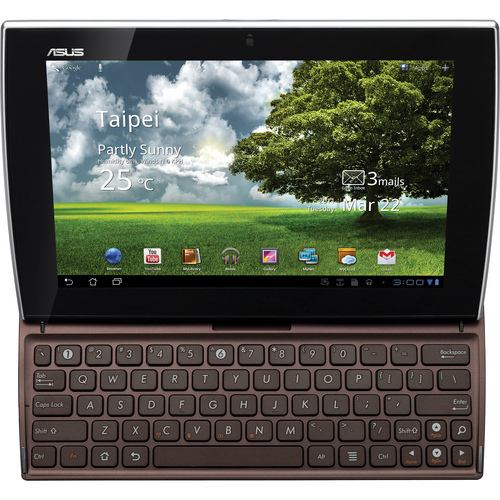 CES: Has ASUS discovered the strategy to take down the iPad?